Men! Risali in Kammanahalli is the place to grab sweet kicks on a budget. The export surplus store specialises in dress shoes and colourful loafers. Kammanahalli is a shopping paradise for men on a budget. Well, for the penny-conscious shopper, we have now discovered another gem on Nehru Road. A compact shop, diagonally opposite Empire, Risali stocks incredible shoe brands at down-to-earth prices. The store sources its wares from the export surplus markets in Delhi and Mumbai. 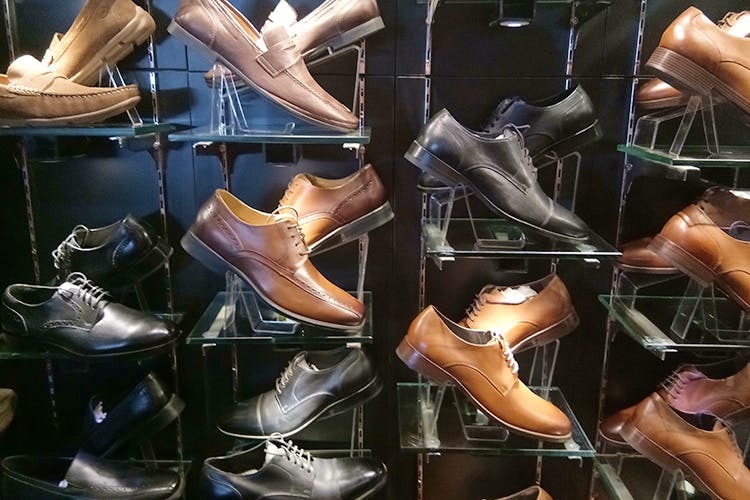 Step inside Risali and you’ll find the walls lined with formal, dress shoes that will have you looking super sharp. They have them in tan leather, in shiny blacks, and in deep blues. You can get lace-ups and slip-ons from the UK and USA, with brands like Cole Haan, Marks & Spencer, Nunn Bush, Florsheim, and Stacy Adams. These are all priced at INR 2,500 – pretty much at half their in-store prices. Risali also has a vibrant selection of loafers. You can pick from bright purples, oranges, yellows and blues. If you are looking to go subtle, they have them in browns and moss greens too. These are perfect to pair with your pristine white chinos or a pair of shorts. The loafers come at about INR 1,250 a pop. Leather wallets from Louis Philippe, belts, and socks are also part of the store’s offerings. If you are looking exclusively for loafers, then, their options are not endless. You may have better luck elsewhere.